BELIZE CITY, Thurs. Nov. 23, 2017-It has been exactly one week since a senior citizen left his home and has not returned. 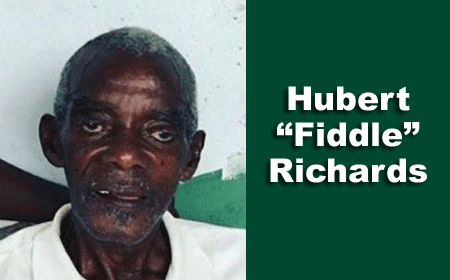 According to police reports, at around 6:30 a.m. on November 16, Hubert “Fiddle” Richards, 83, left his home in Sandhill on a bus en route to Belize City. His granddaughter, Kenisha Richards, today told Amandala that he went to Belize City to visit his wife, Gertrude Richards, at her home in Coral Grove, Belize City. After spending some time with his wife, Richards headed to his grandson’s barbershop on Mahogany Street, where he had his hair cut. Thereafter, he said that he was heading for the bus stop to go home. Video footage now made public captured Fiddle Richards standing at the Lord’s Bank junction at around 2:21 p.m. last Friday. He had apparently gotten a ride from Belize City. Richards did not make it home and his family at Sandhill has not seen or heard from him since he disappeared. Amandala understands that Richards had been battling for a long time with bouts of forgetfulness. Whenever he had been in Belize City, he had always been accompanied by one of his grandsons. On the day of his disappearance, however, he did not tell anyone that he was heading to Belize City, and so he journeyed alone. Since the day of his disappearance, his family has launched their own search efforts to locate him. Yesterday and today, the family combed the village of Guinea Grass in the Orange Walk District, where he was recently seen, according to some sources. His granddaughter, Kenisha, fears that his forgetfulness has intensified. But even after her grandfather has been missing for seven days, she remains positive that he is alive and in good physical condition. Kenisha is asking those who come in contact with her grandfather to immediately contact the nearest police station, or the family at 625-3838 or 604-3026. Richards, a career painter, is slim, about 5 feet 10 inches tall, and is dark-skinned. At the time he was last seen, he had a low haircut and was wearing black loafers; black, long dress pants; a white, long-sleeved shirt; a sweatshirt, and a black cap. His family says that this is the first time that Richards has gone missing.